Sometimes you just need a pep talk. Who better to deliver it than Kid President?! If you haven't seen this Kid President video yet, it is a must! Not only is he super adorable but he shares some great messages about how we need to be on the same team in this game of life and make the world an awesome place. I encourage you to share this video with others who need encouragement and have the potential of making the world a more awesome place! That's why I am sharing it with you all! You ALL make the world more AWESOME by being school counselors or aspiring school counselors and supporting student success! 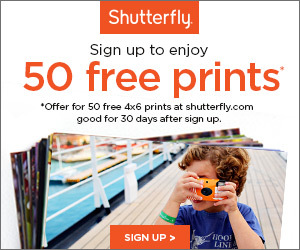 Who will you share this video with? 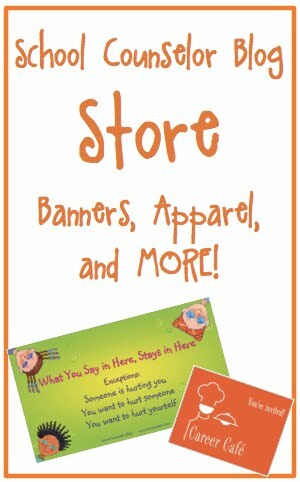 New Free Spirit Publishing Post: Enjoy Moving More! 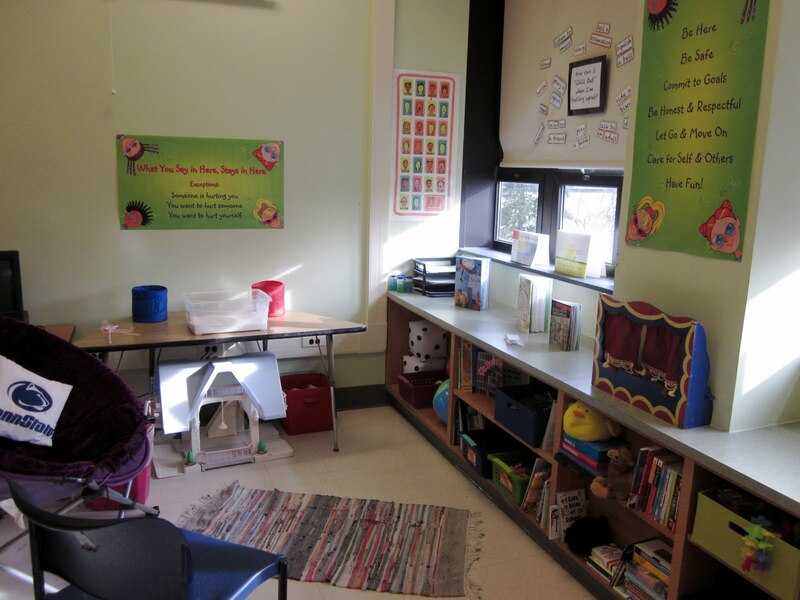 I have a new post on Free Spirit Publishing's Blog! As you all know, life as a school counselor (and just in general) can be very stressful. Self-care has always been one of my biggest struggles. I have been making an effort to focus more on self-care in my life. One of the ways I am caring for my self is by making it my goal to move more this year! In my latest post Enjoy Moving More! for the Free Spirit Publishing's Blog, I share tips and ideas to make exercise more enjoyable. What kind of exercise or physical activity do you enjoy most? What are other forms of self-care you enjoy frequently? 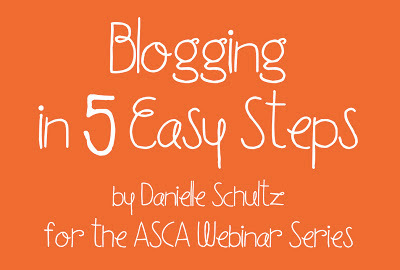 "Blogging in 5 Easy Steps" Webinar Now Available in the ASCA Webinar Archive! It was such an amazing experience to host a webinar for the American School Counselor Association. It was so much fun to take participants through the world of blogging and the steps they need to take to start their own professional school counseling blog. 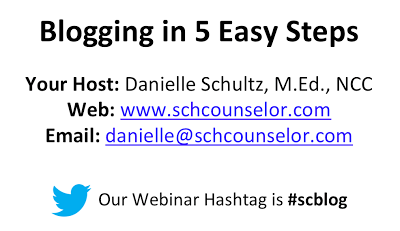 Did watching or participating in the Blogging in 5 Easy Steps webinar make you want to start a schooling blog? 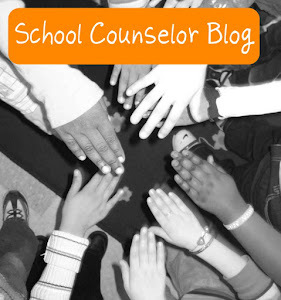 Have you created a school counseling blog since the webinar? A collaboration between many school counselor bloggers across the country is coming together to offer a new experience for many of us. 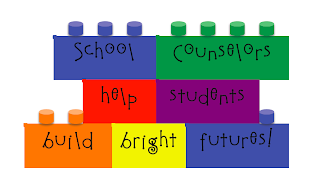 During National School Counseling Week, February 4th - 10th, there will be nightly presentations hosted on Google Hangouts (there is opportunity for participation with this platform) and streamed live over YouTube. You can see the schedule posted above for topics and presenters. All will begin at 8PM EST/5PM PST and last about an hour. One thing that is handy is having a Google account, but you will be able to watch the live broadcast on YouTube through the posted/tweeted link without one. The link should be posted about 30 minutes before broadcast starts, but it may be closer to the start time. 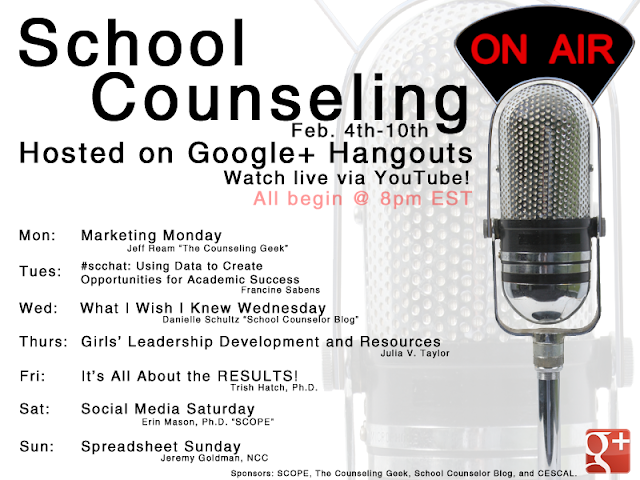 Check out the Official School Counseling On Air Google+ Page for details, links to join, event listing, and other info. Reading up on Hangouts may be useful prior to the event to ensure you can smoothly participate. 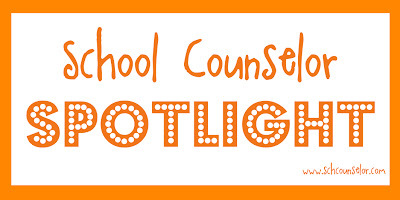 School Counseling on Air is sponsored by SCOPE, The Counseling Geek, School Counselor Blog and CESCaL. Will you be participating in School Counseling On Air via Google+ or You Tube? 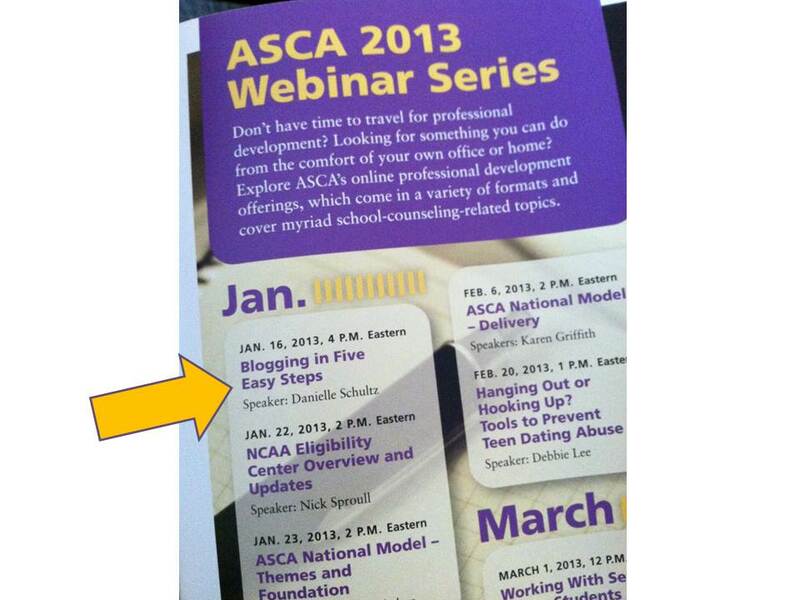 I'm Hosting an ASCA Webinar! "Blogging in Five Easy Steps"
I am so beyond excited to be hosting an ASCA Webinar for the 2013 ASCA Webinar Series. 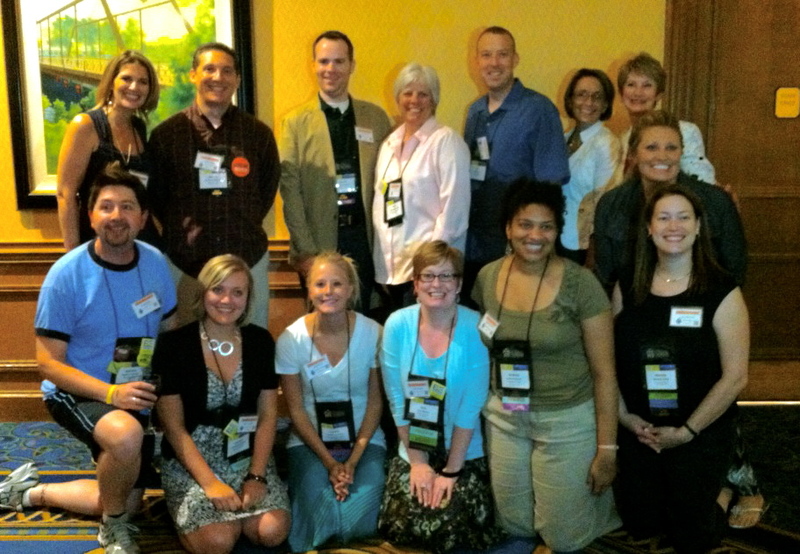 You may have noticed this in your November/December issue of the ASCA School Counselor Magazine. 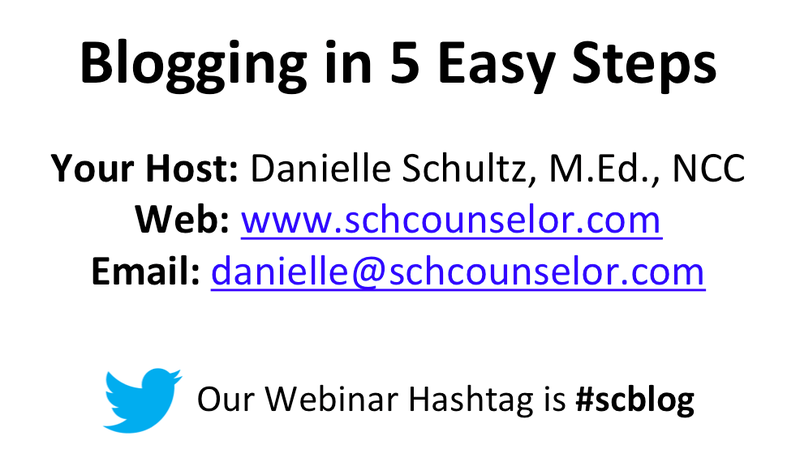 I will be hosting Blogging in Five Easy Steps next Wednesday, January 16th at 4pmEST. 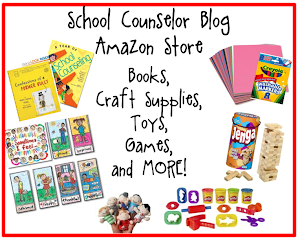 I will be sharing just how easy it is to start blogging as a professional school counselor! More more detailed information about my webinar, Blogging in Five Easy Steps, click on the highlighted link. To register for the webinar, click here. 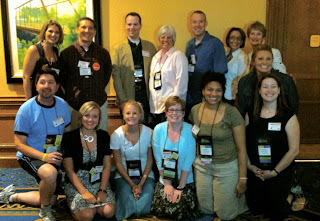 What information would you like to learn about blogging as a professional school counselor? 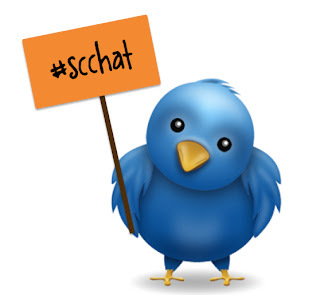 The first School Counselor Tweet Chat of the new year is Tuesday, January 8th at 8pmEST. The topic for this month's School Counselor Tweet Chat is Working with LGBT Students and Families. Darrell Sampson (@CnslrDarrell) will be moderating the chat. We will be tweeting about how school counselors can be advocates for LGBT students and best practices for working with LGBT students and their families. I have a new post on Free Spirit Publishing's Blog! In my latest post, 6 Solutions for Keeping Your New Year's Resolutions, I share tips and ideas for making and keeping a SMART New Year's Resolution. What resolutions are you making for 2013? What strategies can you share for setting realistic goals and reaching them? Please share your comments and ideas in the comment section of my post!